When I learned I had Lyme disease, I went through a strange jumbled up mess of emotions. The doctor’s office called and told me my test came back positive. They wanted me to come in as soon as possible to talk about beginning Lyme treatment. I was near tears. The tears welling up in my eyes were tears of happiness. I was happy to finally know what the cause of all of my strange seemingly unrelated symptoms were. At the same point, I was angry. I was angry at all of the doctors who told me nothing was wrong, the doctors who told me it was just chronic fatigue and I shouldn’t worry about it. 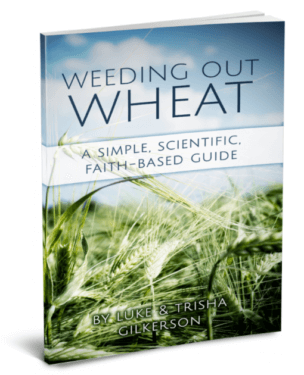 I was frustrated—frustrated that I had spent over a year diligently looking for what was wrong. Over a year of visiting doctor after doctor. 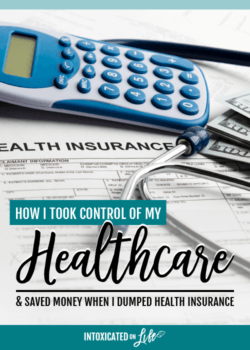 Much time and money went into doctors visits and a 6 month contract with a health coach (that ended up being a waste of money). But in the end I was just relieved. Relieved I could finally begin my journey back to wellness. Now that I knew what was wrong, I needed to figure out how to attack this thing. Immediately, I began to read up on Lyme treatments. I met with two doctors: the doctor who diagnosed me along with another Lyme Literate Medical Doctor to get a couple different perspectives. I devoured articles from those who had been treating their Lyme. I watched youtube videos. I lurked in Lyme disease facebook groups. I chatted on the phone with several other Lymies. I consumed as much information about people who had been successful treating their Lyme as possible. I was overwhelmed and discouraged. I wanted to feel a decisive sense of direction. I wanted the treatment that universally work for everyone. There isn’t one. Some treatments worked for some and seemed to make no difference for others. There is one thing for certain with treating lyme disease: nobody knows for certain what the best way to treat it is. 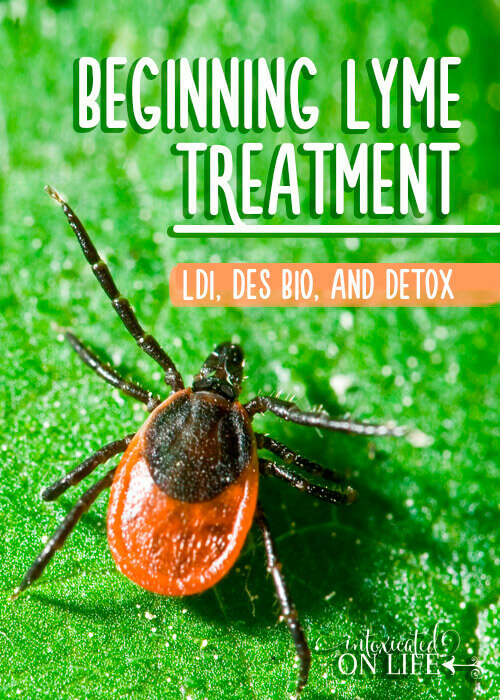 Beginning Lyme Treatment Tip: Just start somewhere. One evening, I was feeling particularly down. I needed to decide what to do. Each week, day-by-day, I seemed to feel worse and worse. I needed to decide, but I felt paralyzed for fear that I’d make the wrong decision. That was it. That was what I needed to hear about beginning Lyme treatment. Just start somewhere. And that is what I did. I’m lucky to have found not only a Lyme Literate Medical Doctor within driving distance, but also one that is integrative. This means, she integrates the best of what modern medicine has to offer with the best that alternative medicine has to offer. Read more about how to find a good Lyme doctor. While she gave me many options for treatment including antibiotics and a few popular herbs, I decided to go another route. Like many Lyme protocols, mine is multi-faceted. It seems that individuals that have the best success in treating Lyme use methods that attack the Lyme and support the body on multiple fronts. I decided to try a homeopathic protocol called Des Bio (only available through healthcare providers). Not the best picture, but I snapped this image with my phone. 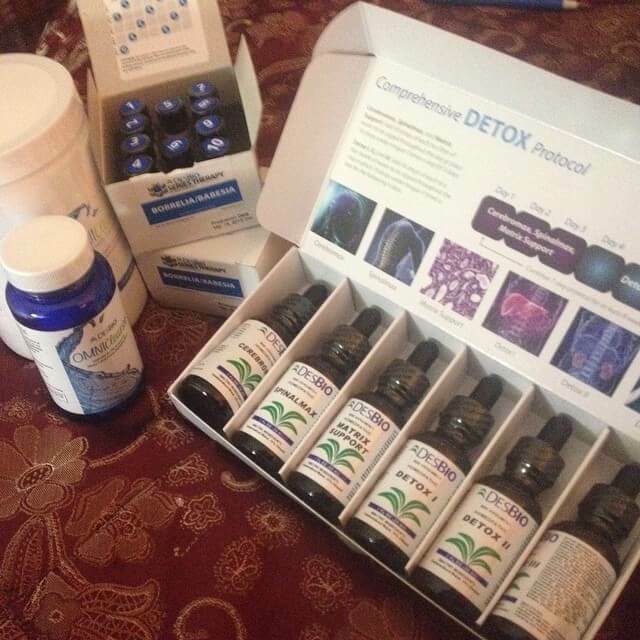 It shows the components of the Des Bio detox, cleanse, and series therapy. I couldn’t find a lot of information online about this particular treatment. But, when I asked my doctor how her patients using it have responded, she stated that everyone has seen some measure of success with it. While that doesn’t mean everyone has gotten completely better, that report seemed positive enough for me to try it. I’m using the Des Bio Complete detox and cleanse along with their Borrelia/Babesia series therapy. My doctor recommends using the detox and cleanse in order to minimize the herxing (i.e. negative side effects you get from treating Lyme disease). She feels it’s been a very gentle, yet effective way to treat lyme disease in her patients. The Borrelia/Babesia series therapy is a homeopathic treatment designed to help your immune system recognize Lyme disease. One of the problems with Lyme disease is that it’s good at changing forms and evading your immune system. This treatment includes 2 boxes of 10 vials. You take one vial every 3 days. Each vial in the boxes has a different strength and frequency. The benefit of pulsing differing doses of this therapy is that it helps to keep your immune system activated. I decided to also try a new, innovative treatment called Low Dose Immunotherapy (LDI). The initial reports on this therapy are nothing short of miraculous. The doctor, Ty Vincent, who developed this therapy claims to have approximately 90% success rate in treating Lyme disease. The theory behind this protocol is that when Lyme enters the chronic stage it’s turned into an auto-immune disease. The reason why you exhibit so many symptoms, is because your immune system is over-stimulated from the Lyme and other environmental toxins. Your body begins attacking itself. With LDI, the correct dosage for each person is unique, so doctors have to use an educated guess to decide where to start you. If they start your dose too low, you’ll likely not feel anything from the treatment. If they start you too high, your symptoms will flare and you’ll feel worse. Nobody wants that to happen, so doctors tend to err on lower doses and go higher as needed. When you hit the right dosage for your body, you’ll have relief in symptoms. This relief might not last long with the first dose. But with each dose afterwards you should feel better for longer. I received my first LDI shot in Mid-April. Yowsers! It stung like a bee. I wasn’t sure exactly what to expect. The day of the shot I felt pretty lethargic and I had a headache. Nothing new. Pretty much the same. By the next day, I was having a good day. By the third day, I was feeling crazy good. I was reorganizing and cleaning out cabinets in my kitchen and closets throughout my house. Trust me, this isn’t normal. I’m anxiously awaiting my next shot. It will be interesting to see how my body responds. My husband calls this my “Wolfman Medicine” but I affectionatly refer to it as my “Crazy Medicine.” In all seriousness, it doesn’t make me turn psycho, but I sure don’t enjoy taking it. I’m taking Coartem to treat one of my co-infections, Babesia. Lyme has friends (other bacteria and parasites) that also travel along with it, that are more formally called co-infections. Babesia is a malaria-like parasite that I’m lucky enough to have acquired along with lyme. Babesia wrecks much havoc in the body. I’m almost convinced it’s worst than Lyme. The racing heart that comes on for no apparent reason—that’s probably Babesia. The mammoth headaches that make me completely non-functional —babesia. The awful head pressure that makes me feel like I’m swimming 8 feet under water—yup, babesia. That time I ran to the ER because my heart was racing and I was having shooting chest pains—babesia too. Life’s a party with babesia. My doctor highly encouraged me to use Coartem for treating my babesia along with the Des Bio treatment. She really believes that we need to be more aggressive with it. So, I took a leap and have been using it. Don’t ask me how I like it though. OK, if you really want to know…I hate taking it. 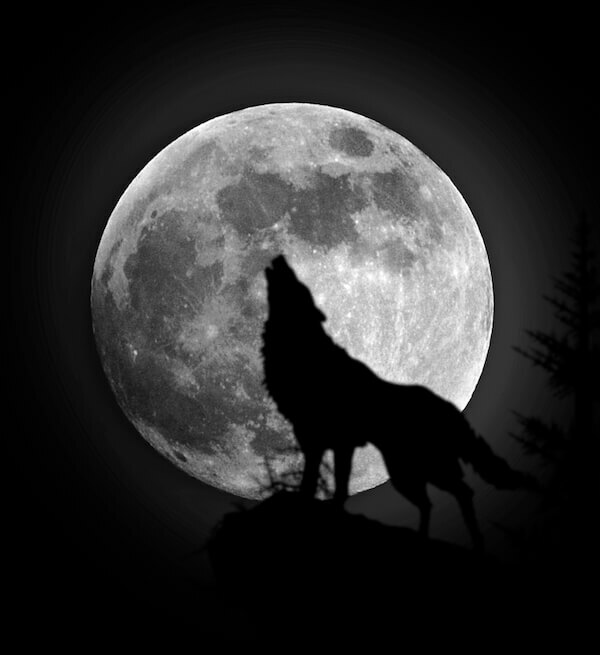 I take it 3 days around full moons and new moons because that’s when the bebesia likes to come out and mate (this is why my husband calls it my Wolfman Medicine). I’m exhausted. I sleep somewhere around 16-18 hours per 24-hour period while taking this medicine. Light-headed and dizzy spells that come and go. No driving. Chest pains and racing heart…more than normal. To date, I’ve done 3 rounds of Coartem. I’m looking forward to chatting with my doctor to see when she recommends we remove this wicked medication from my protocol! There’s a number of other things I’m doing to treat Lyme and friends. It’s important that I support my body. 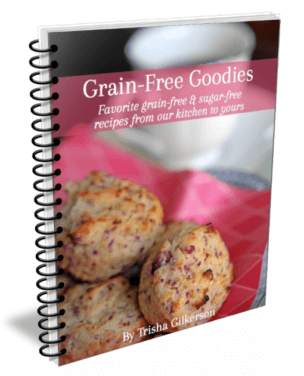 Along with a gluten-free, sugar-free, low-inflammatory diet there are vitamins and supplements that are necessary. Lyme has taken a lot out of my body, so it’s important to restore what’s lost. I’ve made a couple of videos to show you all of the supplements I’m currently taking. They’re nothing fancy, but it’s a nice way to document my journey. If you want all of the nitty gritty details, you can watch those. A few more note-worthy parts of my protocol include: cholestyramine, bi-weekly myers IV bags with glutathione, and Boluke. Cholestyramine – I began taking cholestyramine prior to beginning my Lyme treatment my C4A levels were ridiculously high (over 20,000). They’re supposed to stay around 2,100 or less. This indicates that the bio-toxin load in my body was pretty over the top. Cholestyramine is a medication that binds to bio-toxins and pulls them out of the body. 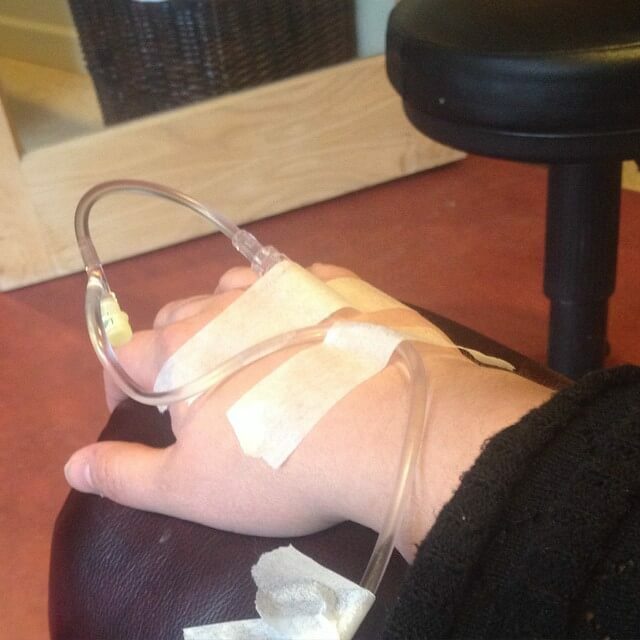 IV Treatments – My doctor wanted me doing weekly IV treatments of myers bags with a glutathione push, but I decided to do them bi-weekly. These simply replenish nutrients in my body that I’m deficient in. Since insurance isn’t paying for my Lyme treatments, the bi-weekly IV bags works better in my budget than the weekly IV treatments. Boluoke – Boluoke is an interesting part of my treatment. I want to specifically mention it, because I think it’s the one thing I’m taking that is causing a real noticeable change. Boluke is a powerful cyst-buster. It breaks up the cysts that Lyme causes in the body. I have these big knots in my legs. They have been growing and causing increasing pain over the past year and a half. My primary doc ran a number of tests, but couldn’t figure anything out. My Lyme doc told me right away they were created from “Lyme sludge.” The Lyme has built lots of cysts which has gunked up my lymphatic system and is causing, pain, inflammation, and lumps. No fun. Good news: since I’ve started the Boluoke (approximately 6 weeks ago) I’ve noticed an improvement in my legs. Bad news: the pills cost about $1 each and I have to take 4 per day. Ouch! Ready for the eww factor? 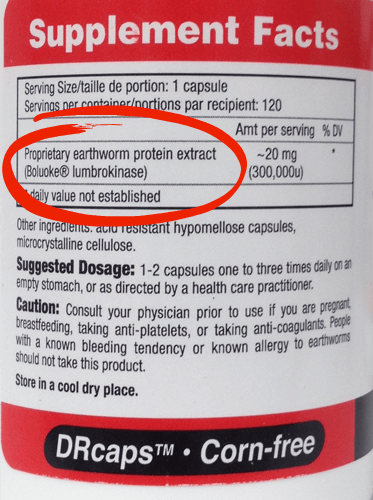 The 1 and only ingredient in Boluoke is “earthworm protein extract.” I’m serious. Maybe it would be cheaper to make an earthworm smoothie every day? Lyme Treatment: Where Do I Go From Here? This is what I decided when beginning Lyme treatment. However, I happen to have a doctors appointment coming up in a few days, so I’m anxious to hear her recommendations. I plan to stay the course on several things I’m already doing, but would like to talk to her about tweaking some things for my Lyme treatment. I’m also interested in adding a few things to my protocol including using an Infrared Sauna and a Rife or Frequency machine (update: here’s my post about Infrared Saunas if you want to learn more about that). Unfortunately, there’s nowhere in town I can go to use either of these. So, logistically speaking (and financially) these are bigger investments. I’d also like to begin regular lymphatic massage and also try out acupuncture. I’m hoping these will further help break up the cysts and increase lymphatic flow. I’m already doing dry skin brushing and trying to bounce on a rebounder for a few minutes each day to help this out, but I’ve not seen much real benefit thus far. There’s no one-size-fits-all when it comes to treating lyme. But sharing our experiences can hopefully help as we seek healing for our bodies. Here’s my update 6 months later after beginning Lyme treatment. Are you a Lyme patient? What’s working well for you? Chronic Fatigue is Bogus! Why are you really tired? Thanks for posting this. It sounds a lot like my Journey. You’re welcome! What sorts of treatments are you using right now? Anything in particular you feel is helping? I am currently doing the LDI for Lyme treatment, sublingual. 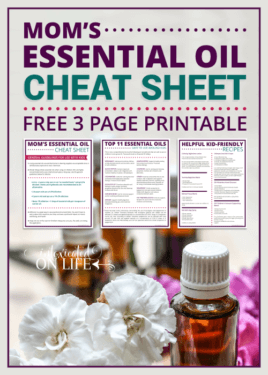 I have had 1 dose of LDI and I had a flare up of symptoms. It is my understanding that it means that the dose was too high. I have been treating for Lyme since January 2012. I started with Oral Antibiotics and after a year I wasn’t any better. I did IV treatments for 3 months. 4 days on and then 4 days off. 4 grams of Rocephin, 1 gram of Vancomycin Monday through Thursday. High Dose Vitamin C, and 3 grams of Carimune on Tuesdays and Thursdays. I felt a lot better after doing the IV treatments and my lab numbers looked much better. Because I was still having die off, I then continued oral antibiotics. Last October (2014) I took myself off of all antibiotics. My gut couldn’t take anymore and I began wondering if I wasn’t having more symptoms from the antibiotics than having die off. On May 16th I took my first dose of LDI for Lyme and waited 2 weeks. I started back on antibiotics, but chose to stop them after 1 week when I was researching the LDI. I felt like the antibiotics were interfering with the whole purpose of what the LDI is supposed to accomplish. I have taken the Coartem in the past and understand what you are referring to with how it makes you feel, etc. I have also done the Myers Cocktails and wish there was somewhere locally that I could do them. They really help a lot. I have tested for the MTHFR and found I have a few heterozygous gene mutations, which explains why my body gets so toxic. I am currently looking in to how to open up the blocked pathways so that my body can detoxify better and faster so that I don’t feel so awful. I am also hoping that the LDI will help with the MTHFR issues too. Hi what dr was treating you ? Getting any better this is scary .. Sorry, 4 days on the IV treatments and then 3 days off. The reason for the 3 days off was so that my body could remove the toxins before hitting the treatment hard again on Monday. 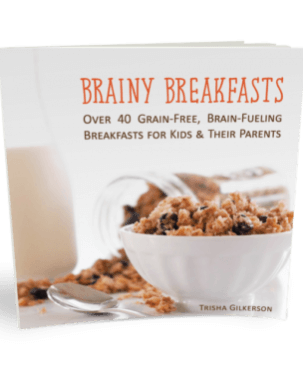 This is very helpful and I will be asking the lld my daughter is going to see about it. She has an appointment in August, but hoping for a cancellation so she can get seen sooner. She is getting sicker all the time. This week she woke up unable to open her eyes because of extreme light sensitivity and pain in her eyes. She is 3 years into the illness because we only recently figured out what was wrong. Your last post is what the Lord used to show me what she has and now all her symptoms make sense. She is only 19 and planning her wedding for October. Sometimes there is so much grief for me over the loss of the life she thought she would have; and now we don’t know how much damage is permanent. She trusts the Lord’s plan though and is spiritually stronger as a result of the illness. Thank you so much for sharing this information! Juli, encourage your daughter that there is hope. I was bit when I was 18. I suffered for years, but I was married at 21 and the Lord blessed us with 6 children. It was 14 years before I was diagnosed and after 3 years of treatment I am in reasonable health. There are some lingering effects, but the the spiritual lessons learned far out weigh the temporary discomfort and inconvenience. I will celebrate my 19 th anniversary this year and I feel so blessed to have walked this path the Lord has given me. My 18 year old daughter is now suffering with Lyme. We laugh sometimes that we lymies will really appreciate those new bodies that await us in eternity. Thank you for sharing Twyla! Such encouraging words. I was diagnosed last week with Lyme, Anaplasma and Ehrlichia (spelling?) with coinfections. I came home with 150 dollars in antibiotics, 1300 dollars in supplements and a 400 dollar dr. visit. I am overwhelmed. This is not sustainable for my household. I am moving back to Seattle in August to be closer to resources but I have no idea where to go. I feel like a minnow in a shark tank with all of the experts and their rates. No cures, claims or promises of health. I really appreciate this post and all of the comments. I am looking up all the supplements etc. I am only at the beginning. I’ve been suffering silently in shame for 12 years. It’s a relief to know but I also want to scream. Where is the hope? Who can I trust? Thank you to all of you that have gone this road before me. I really appreciate your courage and transparency. Yes, it is a very discouraging disease. There hasn’t been enough research done, so there don’t seem to be a lot of “tried and true” treatments. What works for one person, doesn’t necessarily work for the next. This was part of the difficulty for me in deciding which way to go – I wanted to use the BEST treatment. In the end, I think you just have to choose a direction an try it out. It also has to be something that you can afford (and lyme, as you’ve found, can get very expensive since insurance doesn’t cover much, if any treatment). I know it’s been a couple weeks since you commented. How are things going? Are you feeling any better direction? I started all the supplements and the antibiotics. I couldn’t handle the antibiotics at all and stopped on day 5. I had no control of my bowels and kept messing my britches. The supplements don’t seem to be doing anything. I’m also being referred to the ID clinic at the UW Hospital and who knows what they will propose. In the meantime I’m looking at cannabis for symptom relief and the Cowden protocol. But I am shooting in the dark. When it comes to disease my faith doesn’t stand a chance. I feel like I’ve lost all my bearings and I feel ashamed to call myself a Christian. This just feels like too much. Oh no Karen! I’m so sorry to hear that the antibiotics went so poorly for you. I’ve not tried antibiotics yet, and I’m hoping I can stay off of them. 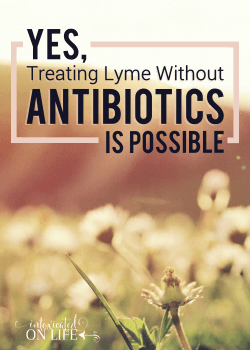 Unfortunately, I’ve not heard great things about hospitals treating lyme disease – they tend to tow the CDC line – just treat it with a round of antibiotics and send them on their merry way. That said, I do hope you have a better experience! 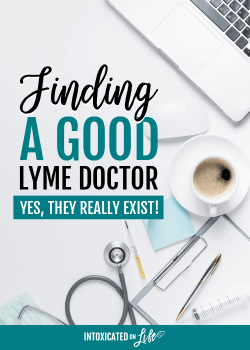 Have you networked with any other lyme patients in your area who you might be able to find out about their lyme doctors? You might consider looking for an integrative doctor who is knowledgeable about lyme. This is the type of doctor I’m using and she know so much about different types of treatments for lyme and uses them all depending on what each individual patient needs – antibiotics, homeopathics, herbs, rifing, etc. Each person is individual and this awful disease needs to be treated this way! Good doctors are hard to find, but they are out there. Feel free to send me a personal email or comment on here trisha[at]intoxicatedonlife[dot]com. If you need help finding a doctor I’m happy to do what I can with the networks I have. I’ll be praying for you – that you’ll get some relief and answers. Blessings! I make my own water kefir with lemon and ginger, and also cucumber lime, as well as fresh goat milk kefir with fruit. It is the bulk of what I drink. It helps, tremendously. I also drink ACV/Baking Soda in water twice a day. I am about to add charcoal tablets. Another thing I was just thinking as I was sitting here reading this comment again. This is an expensive disease, but did your doctor have you start all of those antibiotics and supplements all at once? If so, I’m wondering how wise a move that was. Typically, from my understanding, it’s best to start things one at a time to see how they are working. My protocol is more extensive than what is listed in this blog post (I have an updated post I’m planning to post later this week), but everything has been added gradually – each doctors visit my doctor wants to know where I’m at. What symptoms are the worst. What’s gotten better, what’s stayed the same, what’s gotten worse. She looks over any recent labs… and then we add supplements or take them away. But always we add them one at a time. So…just another thought for you there. I was started on everything all at once. Looking back that was crazy. Thank you for seeing that. It hadn’t crossed my mind. I live in WA state and have been looking in the greater Seattle area for a meet up group of some sort. I also am looking for a doctor like the one you are seeing. Any suggestions are greatly appreciated. The loneliness in all of this messes with me a lot. Support would be amazing. Are you on facebook? You might see if there is a Washington Lyme Disease group on facebook. I found one for Michigan and that is how I got doctor referrals. I had several people mention the doctor I”m currently seeing. I also looked into a couple other doctors I received referrals from on facebook. If you could talk to some people and ask questions about their general approach, I know that would be helpful! If you’re looking for a doctor that does the new LDI protocol, you might check this page on Dr. Vincent’s website as he has a download of LDI providers. Dr. Vincent is the one who developed LDI. I have probably suffered with Lyme 10 – 20 years. In 2007 when I was first diagnosed I was treated with antibiotics until my body finally collapsed on me and I couldn’t handle them. I then went a holistic route and after years of treatments was better. Now I have relapsed and none of the doctors I used are practicing medicine. Do you know of any doctors in the South? I live in Mississippi and had to travel 7 hours for treatment last time. I know I can’t go the antibiotic route again and feel the treatments you mentioned sound like something I would be willing to try. Thanks for sharing your story. I am sorry to hear of your troubles over all of these years! It’s such a shame there aren’t more Lyme literate doctors in the US. My doctor is one of only a couple in the state that offers the LDI treatment (I think). She said she has a waiting list of over 75 patients wanting to get into see her, but she just can’t take anyone else right now. That said, I don’t personally know of any doctors down your way. A couple of things I’d suggest you try – search for doctors on the ILADS.org website. Now, many of these doctors may be doctors that focus on antibiotics, but they should be trained in more than just antibiotics only I believe. Also, I found my doctor by joining at Michigan lyme group on facebook. I asked for referrals to doctors in our state or surrounding states. Then I messaged with several people asking why they liked their doctor and the approaches they take. My guess is there is a similar facebook group for your state too! And my last idea, if you’re interested in trying LDI is to check out this site which has a list of doctors that do LDI by state (you would need to ask if the doctor is using LDI for lyme in their practice). Alternately, you can make an appointment with Dr. Ty Vincent via skype and he will mail you LDI treatments. I’ve heard this is fairly reasonable. If you’re more looking for a doctor that is well versed in homeopathics and/or herbs, I think using facebook groups would be the best way to get a good referral! Where you are you getting the Sublingual LDI from? I have just read your posts with interest. I’m wondering how you are doing? What a wretched illness this is. I have just just found a doctor trained by Dr. Ty Vincent in CT who is willing to treat me via Skype consults and ship the doses to me here in the UK. I just received my first Lyme dose this morning and will take it tomorrow. I’m like you, been through most things and have hit a brick wall and will try just about anything. I’m hoping you are hanging on in there, it’s a test in all ways …my faith in just about everything has hit rock bottom and I can honestly say I have never been so ill in all my life. But for now I’m going this route and hope it brings help, as it’s doing for many. Please update us, it’s good to share, to vent and to bounce it all of others who are going through the same form of hell and know it’s helpful to connect and know you are not alone. Lyme and was told I had 2 yrs to live. I went to 7 drs., but they had no help for me., I refused the antibiotic route. Then I found a dr .on the net and contacted him via phone Aug., 2015. He sent me a protocol and I have been using it for Sept. and Oct. and I am already back to my normal life, though my energy level is diminished. I sent him my labs and his protocol is amazingly effective. He is highly efficient in Lyme and even today attended a symposium on Lyme in Cinn. Ohio. hours from Cinn., in N.C. No Lyme doctors here either! God bless all of you suffering from Lyme. That’s so wonderful that you have been able to find help! Thank you for sharing the website. I’m going to be checking that out. Blessings! I am just starting the Desbio treatment from a chiropracor here in Maine. Only diagnosed 2 weeks ago after 4 tests. I need al the encouragement I can get from anyone with success. Thanks and God Bless! i too am going thru treatment by chiropractor in winthrop maine. i am nearing my last 10 weeks. I started Jan 2015 with 4 “b” illnesses to treat (babesia, borrelia, bartonella, brucella). I am feeling much, much better, i also have 2 other friends that have gone thru this treatment with great success! Hang in there, it feels very futile and frustrating in the beginning but, when you get that first day where you feel better upon waking or for a few hours it makes it all worth it! Thanks for posting this! I’ve been on the journey for three years now. I’d been feeling quite ill for about 4 years prior but everyone just thought it was depression or tension – I’m an artist so it was easy to assume I was being extra sensitive! Anyway, I have tried antibiotics, 2 sets of 2 months which only made me terribly ill. I tried a great many herbs and supplements. I landed on Japanese knotweed, teasel and skullcap, along with a wonderful diet, which seemed to slowly but surely even things out a bit. I mean, I was finally able to get back to work! But still had several day or sometimes up to week-long spells where I felt wretched and wanted only to stay in bed. My symptoms sound just like yours, but I’ll add a very weary and weak feeling which makes walking around feel odd. I can do it, I have good balance, but it just feels like my head is too heavy or something, or like the room is tilted. I also have bouts of extreme depression which I suppose is only natural!!! My eyesight has suddenly gotten much worse, with a ton of floaters, and finally, I get this weird thing where, when I get even the slightest bit excited (either positively or negatively) I start to feel quickly panicky! It happens most when I am chatting with new friends. I suddenly don’t know where to look and feel a rush of absolute terror. Anyway, I had been planning to try Bee Venom Therapy, because it seems to have had offered very strong healing for many people! It’s also extremely affordable. But it’s drawback are that it’s a long term therapy (you are expected to commit to up to 2 years of stings 4 times a week to overcome illness completely), it’s painful, and probably leaves a scarred back. Actually, these seem an ok trade off! But my LLMD recommended I try LDI first, which I have done for two months now. Honestly, I feel much worse than when I started! I’m wondering if that is normal, and is there any possibility that this therapy could offer long term damage? A quick question about exercise: when I’m feeling ill it’s the last thing I want to do. I actually worry that it makes me worse. Can you tell me a little bit about how you approach exercise when you are feeling ill? Many thanks for this dialogue! I hope everyone will feel much better! Thank you for sharing about your journey. I looked into Bee Venom therapy too, but as with so many other treatments it seems the results are hit or miss. It seems to work great for some and not for others. Finding the time 4 days per week to sting myself and probably needing my husbands help…well, I’d do it if I knew it would work, but there aren’t any guarantees. How often are you doing LDI? I only receive 1 shot every 7-8 weeks. From what I understand about LDI, if your dosage is too high it can make you flare and feel worse. most doctors are erring on the side of starting off too low. As far as exercise, I have a hard time with that. I really want to be able to exercise, but it completely exhausts me. I also have a problem with my right leg where I get shooting pain up the outside of it (I’ve been to doctors, chiropractors, physical therapist, etc. and nobody knows what the problem is). I’ve been doing some fairly short walks with my kids and sometimes a little bit of body-weight resistance training and that’s about all I can muster up these days. I think it is fairly normal – from what I’ve read – for exercise to make you worse when you have lyme disease. Thanks for this article and your two videos. They really helped me. I first would like to know how you feel now. – But also the LDI. – Even for the Coartem. I know you herxed a lot with this one. But isn’t a good thing ? Meaning the bacteria is being killed off ? Also, Have you tried the Rife Machine? If so, Did it work on you? I would like to follow the same treatment as you did because I would like, just like you did, avoid antibiotics. Do you think it’s a good idea? i’m so confused, and feel so alone right now. I hope you will find the time to answer me. Hi Nacer…looks like you found my other lyme posts and hopefully all of your questions were answered. But please post any follow up questions you might have that I neglected to answer. “Strange seemingly unrelated symptoms”, was written at the beginning of your article, what symptoms were you having? I’ve been having some strange symptoms going on since November and my doctor thought it was anxiety until I chose to get a 2nd opinion whom then ran more tests and I’m now being treated with LDI for Lyme. I’m just curious as to the symptoms you were experiencing that no one could figure out what was going on. I list out a number of my symptoms in this earlier post on lyme disease, you might want to check them out. But that wasn’t even a complete list. And people with lyme can have varying symptoms as lyme can attack different systems of your body than it does in mine. How has your experience been with LDI thus far? I had to go back and reread. I’ve only had my first treatment and I had a “flare” so now I’m just playin the waiting game until I can get my 2nd dose. Thank you for asking. Just wondering if you would feel comfortable sharing the cost of the homeopathic DesBio treatment? My nutritionist recommended it. I can’t find the cost anywhere. Thank you . It’s been a while since I purchased the Des Bio treatments and I dont’ recall how much each thing cost. Your best bet would be to check with your nutritionist who recommended it. I’m sure she’d be able to give you prices! Why will insurance not cover treatment… It is a disease like West Nile or any other, and they’re covered??!! It’s because, as far as powers-that-be are concerned, there is no such thing as chronic Lyme disease. Antibiotics for a few weeks should clear it up, so that’s all insurance will cover. Of course, that works just fine for people who just contracted Lyme, but for the rest of us, much more is needed. How did this protocol end up working? I had a second set of labs done (western blot both times) and they both came back positive. I’m so sorry to hear you’ve been diagnosed with lyme disease, but it’s better to know now than to continue on for years not knowing. Just take it one step at a time. Thanks so much for sharing! It really helps to hear what works, or doesn’t, for other people. I have just been diagnosed with Lyme Disease as well as CFS and my doctor is considering antibiotics along with supplements and LDI. Because LDI is such a new thing I have found it hard to talk to anyone who has been treated with it for Lyme Disease for a significant amount of time. Do you mind sharing how you are doing now? How long have you been treated with the LDI? Is it still working for you? Have you been able to lengthen the time between doses? How expensive is it? I’m actually not using LDI anymore. I seemed to react really well after the first dose, but then just didn’t notice any difference thereafter. I think I did 5 treatments with it and they were 8 weeks apart. I would have continued, but I became pregnant (though it ended in a 14 week miscarriage) so I had to stop. My doctor moved in that time and I’m seeing a different doc who doesn’t offer LDI. In terms of lyme treatment, it was actually quite inexpensive compared to everything else I was doing. I just found this board while searching for others that have used LDI for Lyme (Borrilea). I’m about to begin my sublingual doses but would like to hear from other with Lyme that are using this therapy. Please let me know how your search is going for a treatment option. I am so happy to have come across your articles! You are a brave,compassionate young woman and I thank you for sharing your journey. We live in New Hampshire. My husband was a logger for many years before a injury left him unable to work. He has had Lyme disease for over 15 years now. When first diagnosed he was put on oral medication for 15 days. Zero follow up from the hospital or doctor. Unbelievable! Over the years I have watched this man I love go through so many changes. 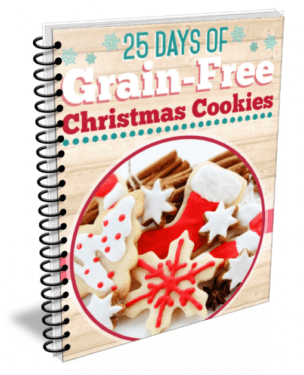 Weight gain, muscle and joint pain, headaches, eye problems, memory loss and a plethora of other problems. About a year ago he went through IV treatments at the hospital everyday for 4 months. They made him sick to his stomach, riled up the “bugs” in his system and did no good. It seems that we just don’t have anyone in this area, even though there are numerous highly respected hospitals reasonably close, that help those suffering with Lyme disease. He is open to anything that may help. I have thought since the beginning that holistic healing combined with meds would be the way to go. The doctors basically told me I was clueless. So in closing I would like to again thank you for sharing your journey. If you or any of your readers have had luck with doctors in my area please comment a name for us. May God watch over you and keep you strong. I’m so sorry to hear what a hard time your husband has had with Lyme. It’s unfortunate there hasn’t been more research on how to treat Lyme so there isn’t a great grasp on how to treat it. I know as I scoured the internet and researched after I received my diagnosis I was terribly discouraged with how little there was out there. I pray your husband finds a doctor who is able to help with with treatments. Can you share who you are seeing in Seattle area for Des Bio treatment and the energy testing please? Do you still believe it has played a large part towards your recovery?